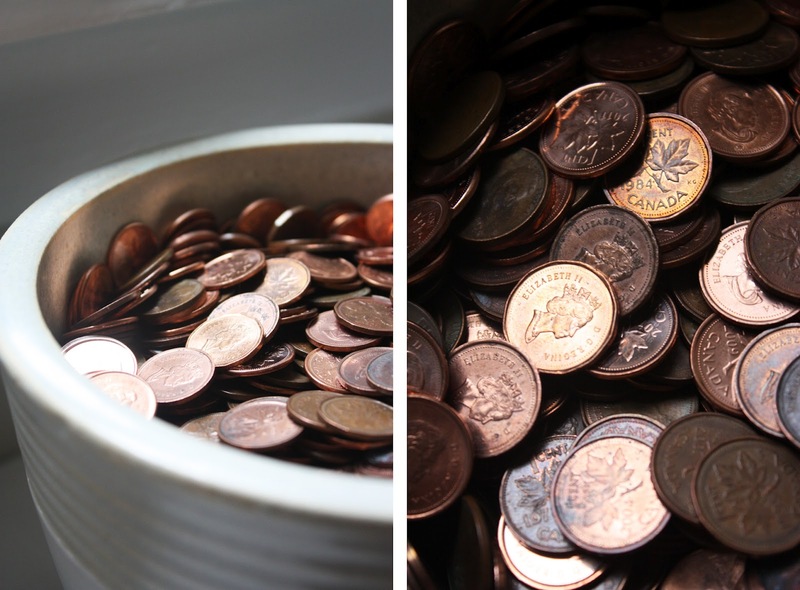 How many among you actually save your pennies? How about your silver change? I am not generally a big fan of small change. I have learned from experience, however, that saving pennies and silver can yield some very nice rewards. Inspired by the Everyday Food budget issue (see the post below) I thought I'd review just a few simple steps that I do each day to keep my change in check. The first step, obviously, is simply hanging on to the pennies and silver that is given out as change. There was a time when I used to tell cashiers to "keep the change" if it was less than a dollar. I would sometimes leave it on a park bench or toss it into a fountain with a hopeful wish: anything just to get rid of it. These days I keep all of my change. I have a zippered section in my satchel that is devoted exclusively to keeping coins. No matter how wealthy you may be, give your change the respect it deserves and hold on to it. It has value! When I arrive home each evening, I empty my satchel. I keep only a few essential items in it to begin with, so it's no trouble. (This is a great way to stay organized and remove anything that doesn't belong in your bag.) I remove all of the change from the zipper compartment and begin to sort it. Once a sorting system is place, it usually takes less than a minute to do this. Big change like two-dollar coins, one-dollar coins and quarters are put to good use for laundry, tips and quick runs to the convenience store. (In Canada, there is more change than in many other countries since our one-dollar and two-dollar currency come in the form of coins.) 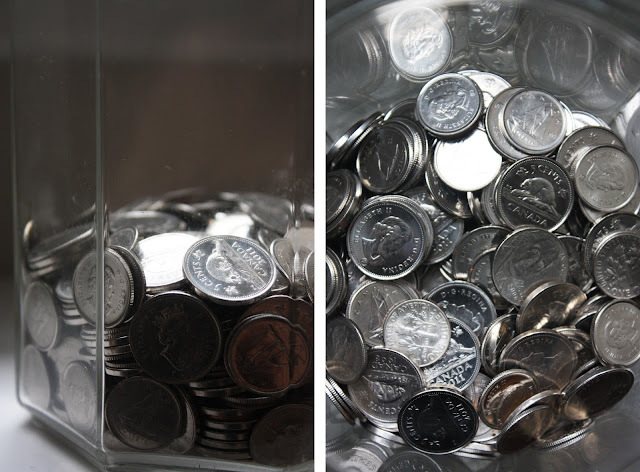 Dimes, nickels and pennies are relegated to two containers I keep in my pantry: one for pennies and one for silver. Having a place to keep the change is essential to this routine. My system, described above, has a purpose behind it: large coins for daily expenditures, small coins for saving. I keep the larger coins in a silver cup on the mantel. The pennies are kept in a ceramic flower pot and the silver is kept in a large glass jar. These were just vessels I had on hand, but any container will do. The silver cup is nice enough to keep out and within easy reach. 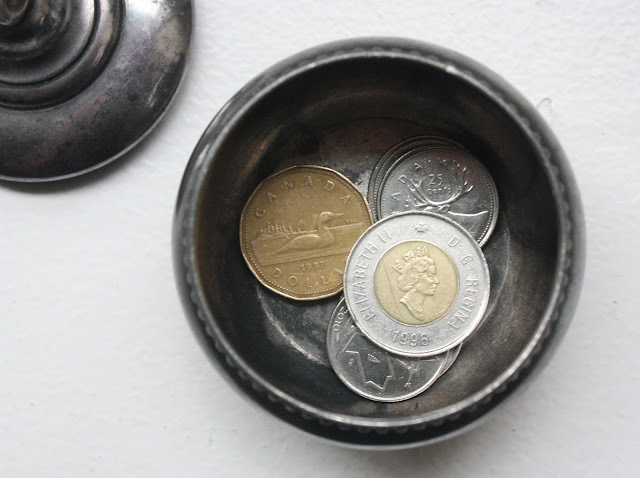 The containers holding the pennies, nickels and dimes are accessible for daily contributions to the pot but are kept out of sight. Once a year, I count it all. This usually happens in the summer. I prefer to count it out by hand (call me draconian) but digital, electronic and manual coin sorters and counters are also sold in many home-office supply stores. They range in price from $20 for a manual sorter to over $250 for a professional digital sorter and counter. There are also kiosks in some grocery stores where you can take your change to have it sorted simply by dumping it all into the machine. It calculates the amount and gives you paper money in exchange. Or, simply take it to the bank in paper rolls and deposit it into your account or cash it through a teller. Last year I counted $98.27 in pennies, nickels and dimes. That is money that might otherwise have been lost in car seats, on sidewalks or in pant pockets if it had been treated carelessly. You could put it into your savings account, donate it to your favourite cause or spend it on something special. I used the money to take my special someone out to dinner at our favourite restaurant. I still have a few months before I count it all, but I'm curious to see how much I have saved this year! I have a penny from 1918 and one from 1914. Anyone know what they are worth? Anonymous, go to http://coins.about.com and click on the Buy & Sell link to find out how much your coin may be worth: anywhere from $1.60 to $500 depending on whether it was circulated or not, and whether it was a limited-edition coin. There's a helpful guide there.